The PDF rules of poker are provided below for Texas Hold’em, the most popular poker variant. Get the PDF version of the Texas hold’em rules. Other popular game variants include Pot Limit Omaha and 5card draw. In Texas hold’em each player is dealt two cards called their ‘hole’ cards. Hole cards can only be seen and used by one person. The dealer button (denoted by a circular disc) is allocated before hands are dealt to allow for the positioning of the forced bets: small blind and big blind, and also to determine who will act first and last in the hand. 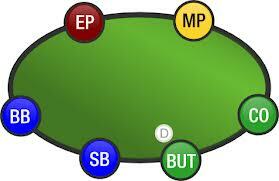 There are a total of four betting rounds: preflop, the flop, the turn and the river. The betting rounds will be detailed further on. If you have a dedicated dealer (such as at a casino), the button will still move around the table so everybody will eventually have to pay the blinds. The button doesn’t show who is dealing in a casino; the button shows who is seated the best position at the table and where the blinds are located. If you just sat down (out of turn) you will have to pay the blinds in order get dealt a hand; otherwise, you can wait until the blinds come around to your seat. You should wait for the blinds as paying twice is unprofitable. The size of the blinds depends on the limit; for example, a 1/2 No Limit Hold’em game would have a big blind of $2 and a small blind of 1$. The small blind and big blind are located to the left of the button. The blinds are an important part of the rules of poker. These forced bets which give players an incentive to play; in other words ‘spice up’ the game. Without the blinds, there would be no penalty for waiting and only playing strong hands. The only hand worth playing would be two aces! Antes are another form of forced bets which are often used the increase the action in some game types such as tournaments and deep stacked cash games. Raise: you can raise the current bet to increase the stakes of the game. If someone has raised before you, you can still raise again – this is call a reraise. The minimum size you can raise is typically chosen to be twice that of the last bet or raise. Call: When you do not want to raise the stakes but want to continue with your hand you can match the current bet. Fold: If you feel your hand is not worth playing any further you can fold your hand and not commit any more bets. Check: If there is no bet placed you can check in order to see the next card. This isn’t applicable to preflop. The blinds are the first bet preflop which must be matched with a call or raised, if a player wishes to continue. Players must act in sequence until all bets are settled. The button must always act last in the first sequence. This first round of betting called ‘pre-flop’ occurs before the flop is dealt. The second round of betting takes places after the three community (shared) cards called the flop are dealt. The action will be to the first player to the left of the dealer. This is opposed to the action starting to the left of the big blind during the preflop betting round. The first player to act has the option to check bet or fold; although you should not fold when you can check for free. The betting rounds after the flop is dealt is collectively known as ‘post-flop’. The third round of betting occurs after the second community card has been dealt. This card is called the turn. Again, the action starts with the active player to the left of the dealer. The fourth and final round of betting occurs when the dealer turns over the river card. The hand ends with the showdown of hands or if there is only one live hand remaining (the other player(s) have folded). At showdown, the player with the best five card combination from their hole cards and the community cards wins the final pot. Split pots occur when both players have the same best five cards. After each hand, the button moves to the left of the dealer. This means everyone will have to play the blinds at some point. Texas hold’em rules are quite simple; however the strategies involved in winning are ever evolving. The rules of Texas Hold’em are just the beginning so head to our poker training sites post here if you want to improve your poker game! The dealer will often take one card off the top of the deck before turning over the flop, turn and river for a total of three cards. The three removed cards are called the burn cards. The purpose of these cards is to make it difficult for cheaters. A player can not buy in for any more chips once he is in the hand. So if they start the hand with $100 they cannot add another $20 to their stack midway through the hand; they have to top up in between hands. he poker hand ranking system is universal to all types of poker games. Be it 7 Card Stud, Texas Hold’em or Pot Limit Omaha a flush will always beat a straight and a full house will always beat a flush. So make sure you pay attention because the ‘poker hands order’ will be useful to you no matter what type of poker you play! To get a printable winning poker hands ranking chart in PDF format click here. Keep this printable PDF hand ranking sheet beside you when you play to make sure you don’t make a mistake! The strongest to weakest hands of them poker hand hierarchy are listed below with the poker hands probability listed in brackets. After reading there will be no debating with friends ‘who has the best poker hand’! Ace, King, Queen, Jack, Ten all of the same suit – the strongest poker hand. Five sequential cards all of the same suit. The second strongest poker hand. Four cards of the same value. Also known as ‘quads’. Three cards of the same value plus two cards of the same value. Usually a winner! Five cards all of the same suit. Five cards in sequential order. Also referred to as a run. Three cards of the same value. Two sets of two cards with the same value. A common hand which can sometimes win at showdown! Two cards of the same value. The player with the highest card wins. Unlikely to be a winner so play with care. A kicker is much like a decider when both players have similar hand types. For example, if player A has A♠Q♣ and Player B has A♣J♠ and the board is A♥K♦5♠ 7♠ 2♦ both players will have top pair with an ace but player A will win because the Q♣ is a better kicker than the J♠. The best five cards in this scenario are AAQ75 whereas the losing hand has AAJ75. A kicker is a very important concept when trying to understand the poker hand ranking system. Split pots occur when both players get to showdown and have the same hand rank. The pot is divided up equally between each of the players. To take an example, if player A has K♠J♥ and player B has K♣Q♠ on a A♥K♦5♠5♣2♠ board both players will have two pair and ace kicker as their best hand (A, K, K, 5, 5). Therefore the pot will be split between the two players. Alternatively, if the neither player can improve the hand on the board it will also be a split pot. If the board is A♥K♦5♠5♣K♠ and player A has Q♠J♣ and player B has 4♣4♠ then both players will be playing the board and thus it will be a split pot. Hence, you cannot have three pair in poker and the best two pair will play. The rules of poker and poker hand rankings are just the beginning for you on your poker journey. One of the core skills in poker is being able to determine whether your hand is strong or weak on a relative scale as opposed to an absolute scale. For example, three of a kind is extremely strong on a board with no flush or straight possibilities but very weak on a board with 4 to a flush or 4 to a straight (e.g. T♥9♥8♥7♥ – any heart or J or 6 beats three of a kind). One key point to note is that in poker all suits are of the same value. An Ace high flush of hearts is the same value as an Ace high flush of spades. The first step to this is remembering if a flush beats a straight, or whether a straight flush beats quads; the next stage is figuring out your hand’s relative strength based on how your opponent is playing, his tendencies and most importantly the board texture as noted. If you can understand the poker hand rankings and relative hand strength you will be ahead of the game; get ready to beat all your friends and opponents at your home games and casinos! Want to accelerate your poker learning? Check out or poker training sites post for the quickest ways to improve your poker game. If you are new to poker and are unsure of what hands you need to play, check out our starting hand charts over at the poker cheat sheet webpage.